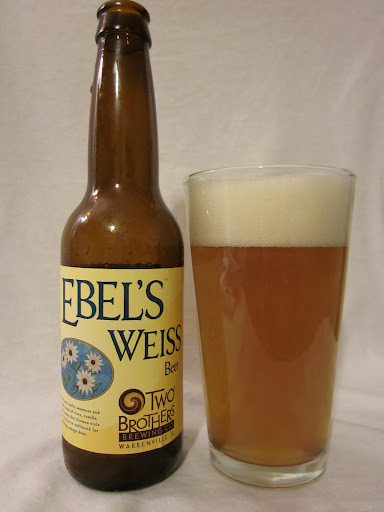 BONUS REVIEW: Two Brothers Edel’s Weiss Beer, Because I Have Been Slippin. I loved Two Brother’s Askew and I want to show this brewery some moar love, so here’s a bonus review, strictly for the haters. Two chains, coupe the color of mayonnaise. Not my favorite style, but when it is 95 degrees, you go back to your roots. A: This has an uncommonly radiant profile to it. The yellow are crisp and inviting, like that VICs vapor rub mask, you can’t seem to shake the impression it leaves. Mild lacing and almost no carbonation. S: This is where this beer shines to an incredible degree. The nose is full of banana, clove, lemon, and funky Belgian yeasts. It comes across with an almost dunkelweizen character, but wow, still very impressive. T: Sadly, the banana and clove is largely lost. You get some banana but mostly orange in the taste and a sort of biscuity, crackery sort of foaminess taste to it. It doesn’t necessarily blow me away, but it is refreshing and a bit of acidic maltiness goes a long way. M: The mouthfeel has a light coating that agitates into a big foamy frothiness like a Belgian wheat latte. The lingering Belgian yeast has this cool spiciness to it that reminds me of a weak saison. It’s like Minkus from Boy Meets World, it’s only there for a bit, but its complex and interesting until it abruptly leaves. D: This is an incredibly drinkable beer and, assuming it doesn’t cost an arm and a leg, I am sure it will keep Midwest people happy living in their sad, square states. Maybe if we shipped a few cases of this to Ohio, they would refrain from sending to LA every single fashion student and dude who learned Everlong on the accoustic guitar. We can only hope. When the heat is on, you can’t believe your mouth after having this.